There is always somebody tending the flame, even when the spotlight is removed, and the publicity vanished. Luci Murphy is a preeminent advocate of utilizing culture to advance social and political justice. She is often the featured vocalist at progressive events. Her boundless energy has made Murphy indispensable in organizing Latin American solidarity, the peace movement, sustainable development and other progressive causes. She is a native of D.C. where she is a vocalist who often leads group singing, but “sun-lights” as a medical interpreter of Spanish and English. She has a long history of community activism, especially working with children at risk. Murphy visited Lebanon to observe Palestinian Refugee Camps, China just before the normalization of relations with the U.S., Brazil for a grassroots organizing conference, and Cuba to oppose U.S. travel restrictions. Teaching for Change is happy to share this interview with Luci Murphy by Dr. Marsha Coleman-Adebayo from the Black Agenda Report. Through Murphy’s story, readers learn about the history of D.C. beyond the monuments from the 1960s to today. Teaching for Change had the honor of collaborating with Murphy when we offered summer institutes for DCPS on multicultural education approximately 15 years ago. Murphy connected arts, music, and social justice by introducing teachers to songs they could use in the classroom such as Nikosi Sikelel’ I-Africa, On a Monday (about the convict lease system), This Little Light of Mine, Amazing Grace (sung in Cherokee), Gracias a la Vida, and many more. She continues to offer powerful performance workshops in schools, engaging teachers and children of all ages with the music and message. A past president of the D.C. League of Women Voters, she has also served on the Steering Committees of the People’s Music Network, “Health Care Now!,” and Washington Inner-City Self Help. 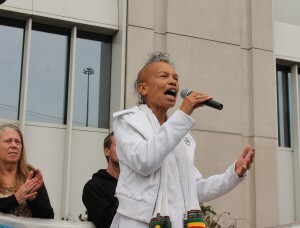 She has also been the convener of the Gray Panthers of Metro D.C., an associate producer of Sophie’s Parlor Women’s Radio Collective at WPFW 89.3 FM, the Pacifica Station in D.C., and contact person for the Community Coalition for Peace and Justice. Currently, she sings with the SGI New Century Chorus and the D.C. Labor Chorus. In 2007, she received the Paul Robeson Award for Peace and Justice from the Friends of the People’s Weekly World. In 2012 the Emergence Community Arts Collective gave her its “IN HER HONOR” Award. Murphy has been performing since her childhood in the 1950s. To reach the members of the diverse human family, she sings in ten languages: English, Spanish, French, Creole, Portuguese, Zulu, Arabic, Hebrew, Cherokee, and ki-Swahili. She draws on the folkloric traditions and musical idioms of all these cultures, as well as her own roots in Spirituals, Blues, and Jazz. Marsha Coleman-Adebayo: How does your work as a cultural warrior play a role in the cultural liberation of African people? Luci Murphy: I am a singer and a song leader. I select songs to sing that have a message, and I get people to sing and play instruments with me. The message makes people think, and singing together gives us a sense of power that comes from hearing others sing with you. It is also effective in demonstrations to have the whole crowd singing. That calls attention to the issue. A good song for crowd participation has a narrow range so that people who are not used to singing can join in. The song should have repeated lines or a chorus that is easy to follow. An example is “We Ain’t Gonna Move” which is based on a traditional spiritual melody. There are about 10 of those old Southern melodies that keep popping up in different songs. I think that they are in our DNA. Marsha Coleman-Adebayo: Could you provide a synopsis of your political/cultural history for our readers? Luci Murphy: I started in fifth grade getting the girls to sign a petition for the girls to go out and play on the playground. There was a recreation period when the boys were sent out on the playground and the girls stayed inside. I was really not very athletic, but I felt that we girls were bored staying inside and that we needed to play too. At the same time, I attended the radical Episcopal Church in my neighborhood—St. Stephen and the Incarnation. We marched down 16th Street to join the 1963 March on Washington. I got the church to send me to the summer program in Puerto Rico where I met the radical priests in the Episcopal Church there. I knew about D.C. colonial status, living in Puerto Rico allowed me to see another colonial situation and meet people who wanted independence from the U.S. The children whom I was supervising in summer camp there, taught me to speak Spanish. That summer in Puerto Rico opened my eyes to another culture, one which was much less violent, than the one I was used to; one in which the young and old celebrated and danced together. Where I was from, not only did the different races not talk to each other, but different generations did not interact socially on any regular basis. The Student Nonviolent Coordinating Committee (SNCC) had an office in D.C. Their members and others founded the New School of Afro-American Thought in which volunteers taught anyone who wanted to learn about African history and literature. We were discarding the self-hatred which Malcolm X described so vividly, and learning to respect ourselves. As a high school student , I attended classes there after school. My mom would come along and listen. The organizers loved to see her. Many of them had been rejected by their families because of their activism or their Afro-centrism. 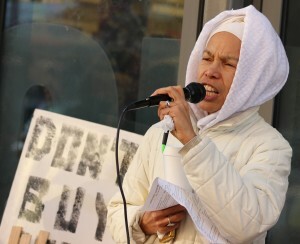 Read the entire interview with Luci Murphy at Black Agenda Report. Fire @ the Fridge (We Ain’t Gonna Move performed by Auntie Luci Murphy and friends) from Words Beats & Life on Vimeo.